Can I get a drumroll please…” the pastor baited. Every child’s eyes were wide with the delightful suspense of possible victory. The crowded pews of kids erupted, half in jubilant shrieks and the other half in an “awwwww…” But all of them experienced the blessing that flows from an obedient step in serving God’s people. Parenting is tough stuff. Summertime can put an extra stress on schedules that don’t allow for stay-at-home-parent down-time, and further tax the juggling of working parents. The absence of structured school days challenge “teachable moment” opportunities. Here are five ways VBS can keep the reel running. VBS teaches kids to relate everything back to God, which is a healthy perspective to gain. It’s not something they’re going to learn outside of church, but it’s the core of our faith. Some points on the childhood map can be plotted in absence of the parent watch. A brief stint away from home can allow the opportunity for a mentor to repeat words of wisdom into your child’s ears. Parents can repeat the same refrain of wisdom, but when their favorite small group leader, coach, pastor or teacher echo’s the same sentiments… ears perk up and seeds are watered. VBS encourages children to request prayer, and pray for others. It helps them grow their bedtime and mealtime prayers into something connected to current situations. It welcomes them into the Christian camaraderie of praying for each other. There’s nothing sweeter than little voices praying into big microphones. In a safe place, where the judgment gloves are off and the forgiveness hats are on, friendship in faith is forged. Jesus didn’t favor one friend over the other. He was kind, but did not let others waver His ethics. Our personal best friend, He will never leave us alone. Humanity bonds us together in the rollercoaster of relationships, but we are never alone. Youth need to know how to lean on each other, their parents and mentors, and most importantly… for those moments to expose Jesus. It’s a crucial concept for kids to grasp amidst the treachery of bullying that has shocked school hallways. VBS allows them to opportunity to experience the joy of worship, and begin to connect the power of singing those songs to lifting their spirits. The songs my kids learn at VBS every year get stuck in their head and hidden in their hearts. They teach the songs to their friends, to me, to the dog, to their Barbies… I hear them singing them as they play, in the shower… all over. 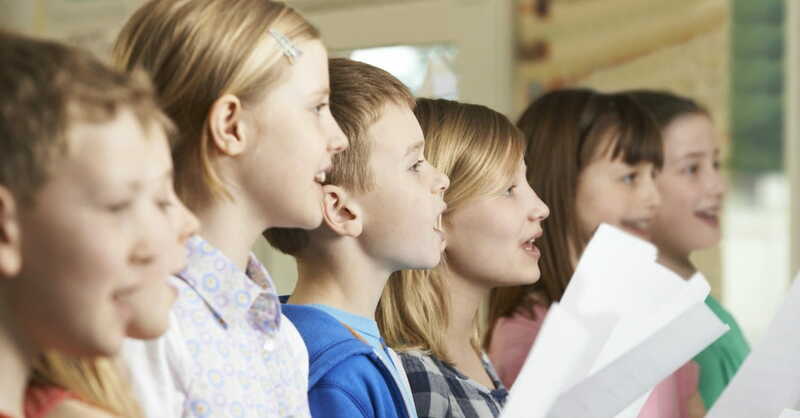 Singing praise teaches them be joyful and thankful for the world they live in. Smile, laugh, dance, and sing! God knows why the truth of those verses are tucked inside of their souls. He will faithfully surface those treasured childhood lyrics one day when their hearts are desperate for a joyful song. VBS teaches generosity. The mark of a Christian is their search to help others rather than be helped. Children need a chance to live this out in basic ways so that they can make a healthy transition from parental dependency. They are all God’s children, and VBS is a great way for parents to lead them back to His feet. He’s got a plan for each of our kids. Each one is designed to serve His Kingdom. By getting them involved in VBS, they have the opportunity to start feeling the tugs on their heart that are wired from within. Dropping them into that environment opens their eyes and stirs their hearts. It’s fun to watch them want to give and help. It reminds us that we are created in His image. VBS provides a peace in knowing your kids are absorbing truth in your absence. God blesses obedience, and I believe that when we place our kids within His walls and are willing to “let go” and let Him take over for a little bit, our efforts are blessed and our hearts experience His peace. Parenting is hard. Christian parenting is even harder. God didn’t promise it would be easy, but He did promise it would be worth it… and He does assure us that we don’t ever have to do it all alone. Remembering my children are His removes the pressure I place on my parenting. An annual step aside from teaching the lesson allows them space to absorb it from Him… and my mind a moment of peace to process the blessing of His providence. 1. If cost is a concern, there are free programs out there. 2. If the program at your church doesn’t fit into your schedule, look for others in your community. Most welcome all denominations. 3. Donate. Be prepared to get into the spirit of giving. Not just money, not just stuff… but a heart of service.